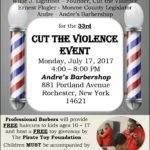 Professional Barbers will provide FREE haircuts to kids ages 10 – 17 and host a FREE toy giveaway by The Pirate Toy Foundation. Children MUST be accompanied by a parent or guardian. Error: Error validating access token: Session has expired on Sunday, 24-Mar-19 14:37:51 PDT. The current time is Sunday, 21-Apr-19 05:29:30 PDT.